Looking for a stress free Italian elopement package that delivers all the romance and magic of a classic Italian religious wedding and none of the paperwork? Our Religious Ceremony Package has been designed for you! We know what a bore all the stressful legal paperwork required for a legally binding elopement is, especially if you just want to jump on a plane to Italy and tie the knot! Our No Stress Elopement Package, allows you to do just that and, should you wish, get legally married in your country of origin prior to your dream Italian wedding. This stress-free package bundles together everything we know couples want from a romantic Italian wedding. 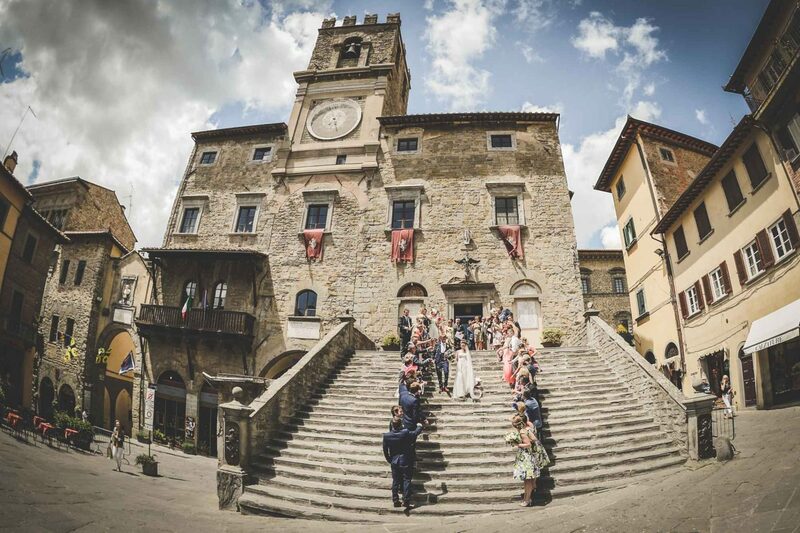 The package includes a beautiful religious ceremony in Cortona’s stunning cathedral, complete with hair and makeup for the bride, music, an exquisite wedding meal for two and many more special features. See below for a detailed breakdown of everything we’ve included. We’re also more than happy to tailor the package upon request, just let us know if you have any requests or special requirements. (the price of the package is intended for 2, meaning €2313 per person. )The prices include the taxes (VAT 22%).This package is perfect for 2 persons. What’s more, it is the best solution for a small size party (8-12 people). Any additional services that are not described or listed above are not included in the package. The venue fee is already included. Please value this piece of information when confronting prices with other companies. Then the bride and groom process to the chancel to sit together. The bridal couple may process up the nave together to the chancel and may sit together. God has created us to live in harmony with him and with each other. He has ordained that man and woman shall be one, and he has confirmed this fellowship by his blessing. Marriage is God’s generous gift. To live together as man and woman is to live in trust and love, to share joy and sorrow and to faithfully stand by each other until life ends. The Minister gives an address based on one of the lessons read under part or on another appropriate text from the Bible! The bride and groom leave the church together. Full assistance on the wedding day. The ceremony will be conducted by an English speaking priest. Our florist can capture your idea about your ideal bouquet perfectly; trust their artistic skills and let them create for you the flowers you’ve dreamed about all your life. All our florists are both talented and also extremely helpful, flexible and friendly and even if you will require bridal bouquets that might seem unusual or peculiar they will capture your ideas perfectly and to quote what an ex bride said : “the flowers will turn out to be even better than what you have envisioned”. You will be receive the photos by “We transfer” within 15 days from the wedding day. Saving files in my archive for 1 year. Vegetarian course made by a basket with dressed salad, grilled vegetables and vegetables flan.